Industrial tour is planned on March 9 (Thursday), for which four courses [A]-[D] have been prepared as listed below. Please be advised to carefully read the following instructions before applying to the industrial tour. If you wish to attend, please enter your 1st to 4th choice on Online Application. You will be notified of your confirmed tour via e-mail by the end of February, 2017. Please avoid wearing shoes with slippery surfaces, such as high heels and sandals. Also, please refrain from having on clothes exposing your skin, such as short sleeves and half pants. For security purposes, please follow the instructions of staff throughout the tour. In the tour, please do not touch any equipment, machinery and products including exhibits. Do not drink alcohol before the tour, nor eat and smoke during the tour. For security purposes, do not take any pictures and videos in all the area of factory. Please turn off a camera-equipped mobile phone or a smart phone. Note that, when the number of applicants exceeds the limit of each visit course, we might ask you to kindly move to your next choices. Applicants belonging to same industry might get their participation withheld. The history of J-TREC Corporation began when it was founded as Tokyu Car Corporation in June 1946. Since the foundation, it has produced about 22,000 railroad coaches. Since April 2014, as one of the corporations of JR East Group, J-TREC Corporation having three production sites in Yokohama, Niitsu and Wakayama, is capable of producing up to 600 coaches per year. The corporation covers productions of containers and turnouts also. 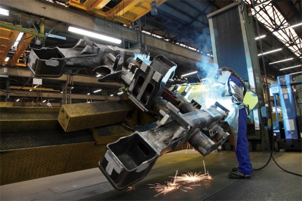 In visiting our production facility, the visitors can sequentially tour production processes of the vehicles from the fabrication of train vessels through final assembly. J-TREC produces coaches of various materials such as stainless steel, aluminum, and so on. 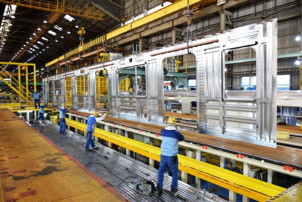 Especially, as the pioneer of stainless steel train vessel production, the corporation is putting emphasis on the development of next generation coach series named “sustina.” Please take a close look at the production process of stainless steel coaches in the tour. Nissan Motor Co., Ltd. is a Japanese automobile manufacturer producing and selling more than 5.4 million vehicles a year globally and has more than 58 plants in global. They have already started to introduce some IT systems since 1989 in order to improve OEE and realize NPW, Nissan Production Way. Currently they are trying to develop some equipment diagnosis systems in order to realize “Zero major break down” in plants by using IoT technologies. 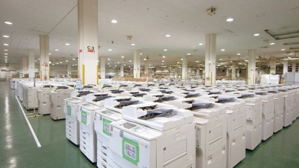 [C] RICOH Eco Business Development Center, RICOH Company, Ltd.
At the foothill of scenic Mt. 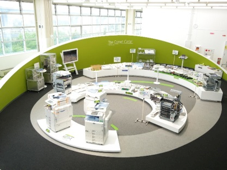 Fuji, the visitors can tour Ricoh Eco Business Development Center, Gotemba, which consists of remanufacturing plant of photocopiers, explanations of R&D in promising eco-technologies, and a neat exhibition area. [D] Yokohama Research Laboratory, Hitachi, Ltd.
We have prepared a space where we can experience Monozukuri (manufacturing craftsmanship) of the future, focusing on coordination among Man, Machine and Material. To resolve industrial issues, we can apply logistics simulation, work anomaly detection and human-robot collaborative production technologies.